Oh, the Thinks you can think...when you think about Seuss! In this fantastical, magical musical, some of your favorite Dr. Seuss characters are lovingly brought to life with the Cat in the Hat, Horton the Elephant, Gertrude McFuzz, Lazy Mayzie and all of the Whos of Whoville. These classic, colorful tales are brought together by Jojo, a young "thinker of strange and wonderful thinks," in a special one-hour show that's perfect for kids (and parents) of all ages. All performances will be followed by a Q&A session with the cast, so stick around and ask your burning questions! 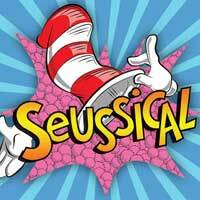 It's a show the whole family can enjoy, so don't miss Seussical the Musical when it comes to Lincolnshire's Marriott Theatre. "...Hats off to Marriott Theatre for its "theater for young audience" program. The sparkling one hour shows they bring to families is both educational and very rewarding. Exposing live theater to children at a young age has been a great thing for our family. My kids grew up on theater and now my grandkids are doing that as well. The problem for me is that as they get older, they are becoming to old for the one hour shows geared for the younger crowd. This being said, I have ways of finding other guests to invite. Family friends with kids of the perfect age. I always like to share my thoughts with you and add to them with the younger kids. If you are planning to bring your child or grandchild to a show, having thoughts from a child means more to making that decision." "...Audiences searching for excellent family entertainment should look no further than the Marriott Theatre in Lincolnshire. It's current offering is guaranteed to charm the children, give grownups a good guffaw and and spring us into the warmer season with relish. This musical simply blossoms with fun. "Seussical," with its sweetly honest story of friendship, offers a full hour of laughter and music. A dozen talented Chicago actors breathe life and levity into these beloved Dr. Seuss beloved characters; and Flaherty and Ahrens' catchy score delight with a bounty of infectious songs and dances. This may not New York, but William Carols Angulo's production is as polished as anything you'll see on Broadway. With all the talent and fun this production offers, audiences will be telling themselves, "How Lucky You Are."" "...You don't have to be a kid to laugh, tear-up, applaud and walk out grinning from Marriott Theatre's latest musical supposedly geared to young audiences."